Igor I (Old East Slavic: Игорь, Igor'; Old Norse: Ingvar Røriksen) was a Varangian ruler of Kievan Rus' from 912 to 945. 6378–6387 (870–879). On his deathbed, Rurik bequeathed his realm to Oleg, who belonged to his kin, and entrusted to Oleg's hands his son Igor', for he was very young. 6388–6390 (880–882). Oleg set forth, taking with him many warriors from among the Varangians, the Chuds, the Slavs, the Merians and all the Krivichians. He thus arrived with his Krivichians before Smolensk, captured the city, and set up a garrison there. Thence he went on and captured Lyubech, where he also set up a garrison. He then came to the hills of Kiev, and saw how Askold and Dir reigned there. He hid his warriors in the boats, left some others behind, and went forward himself bearing the child Igor'. He thus came to the foot of the Hungarian hill, and after concealing his troops, he sent messengers to Askold and Dir, representing himself as a stranger on his way to Greece on an errand for Oleg and for Igor', the prince's son, and requesting that they should come forth to greet them as members of their race. Askold and Dir straightway came forth. Then all the soldiery jumped out of the boats, and Oleg said to Askold and Dir, "You are not princes nor even of princely stock, but I am of princely birth." Igor' was then brought forward, and Oleg announced that he was the son of Rurik. They killed Askold and Dir, and after carrying them to the hill, they buried them there, on the hill now known as Hungarian, where the castle of Ol'ma now stands. Igor' twice besieged Constantinople, in 941 and 944, and although Greek fire destroyed part of his fleet, he concluded with the Eastern Roman Emperor Constantine VII a favourable treaty (945), the text of which the chronicle has preserved. In 913 and 944 the Rus' plundered the Arabs in the Caspian Sea during the Caspian expeditions of the Rus', but it remains unclear whether Igor' had anything to do with these campaigns. Prince Igor Exacting Tribute from the Drevlyans, by Klavdiy Lebedev (1852-1916). Igor was killed while collecting tribute from the Drevlians in 945. The Byzantine historian and chronicler, Leo the Deacon (born ca 950), describes how Igor met his death: "They had bent down two birch trees to the prince's feet and tied them to his legs; then they let the trees straighten again, thus tearing the prince's body apart." Igor's wife, Olga of Kiev, avenged his death by punishing the Drevlians. The Primary Chronicle blames his death on his own excessive greed, indicating that he tried to collect tribute for a second time in a month. As a result, Olga changed the system of tribute gathering (poliudie) in what may be regarded as the first legal reform recorded in Eastern Europe. Drastically revising the chronology of the Primary Chronicle, Constantin Zuckerman argues that Igor actually reigned for three years, between summer 941 and his death in early 945. He explains the epic 33-year span of his reign in the chronicle to be the result of its author's faulty interpretation of Byzantine sources. Indeed, none of Igor's activities are recorded in the chronicle before 941. ^ Tarasenko, Leonid (27 February 2008). "Korosten (Iskorosten): A small town with a great history". geocities.com. Archived from the original on 26 October 2009. Retrieved 16 February 2014. ^ Zuckerman, Constantin (1995). "On the Date of the Khazars' Conversion to Judaism and the Chronology of the Kings of the Rus Oleg and Igor: A Study of the Anonymous Khazar Letter from the Genizah of Cairo" (PDF). Volume 53. Revue des études byzantines (1): 237–270. doi:10.3406/rebyz.1995.1906. ISSN 0766-5598. Retrieved 5 July 2016. Rurik, according to the 12th-century Primary Chronicle, was a Varangian chieftain of the Rus' who in the year 862 gained control of Ladoga, and built the Holmgard settlement near Novgorod. He is the founder of the Rurik Dynasty, which ruled the Kievan Rus' and its successor states, including the Grand Duchy of Moscow and the Tsardom of Russia, until the 17th century. Sviatoslav I Igorevich, also spelled Svyatoslav was a Grand prince of Kiev famous for his persistent campaigns in the east and south, which precipitated the collapse of two great powers of Eastern Europe, Khazaria and the First Bulgarian Empire. He also conquered numerous East Slavic tribes, defeated the Alans and attacked the Volga Bulgars, and at times was allied with the Pechenegs and Magyars. Oleg of Novgorod was a Varangian prince who ruled all or part of the Rus' people during the late 9th and early 10th centuries. The Drevlians were a tribe of Early East Slavs between the 6th and the 10th century, which inhabited the territories of Polesia and Right-bank Ukraine, west of the eastern Polans and along the lower reaches of the rivers Teteriv, Uzh, Ubort, and Stviga. To the west, the Drevlians' territories reached the Sluch River, where the Volynians and Buzhans lived. To the north, the Drevlians' neighbors were the Dregovichs. Askold was a prince of Kiev and founder of the first Vikings' state in Dnieper. According to the Nikon Chronicle Askold's name was spelled out as Oskold. Nonetheless, Askold is widely popular however after the Primary Chronicle where he along with another voivode Dir were of Rurik's clan in the 870s. That chronicle implies that they were neither his relatives nor of noble blood. The Caspian expeditions of the Rus' were military raids undertaken by the Rus' between 864 and 1041 on the Caspian Sea shores, of what are nowadays Iran, Dagestan, and Azerbaijan. 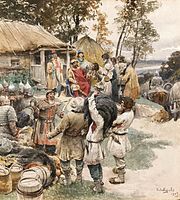 Initially, the Rus' appeared in Serkland in the 9th century traveling as merchants along the Volga trade route, selling furs, honey, and slaves. The first small-scale raids took place in the late 9th and early 10th century. The Rus' undertook the first large-scale expedition in 913; having arrived on 500 ships, they pillaged in the Gorgan region, in the territory of present-day Iran, and more to the west, in Gilan and Mazandaran, taking slaves and goods. On their return, the northern raiders were attacked and defeated by the Khazars in the Volga Delta, and those who escaped were killed by the local tribes on the middle Volga. 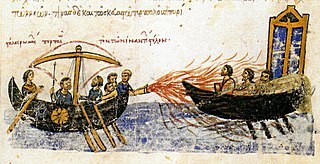 The Siege of Constantinople of 860 was the only major military expedition of the Rus' Khaganate recorded in Byzantine and Western European sources. The cause of the siege was the construction of the fortress Sarkel by Byzantine engineers, restricting the Rus' trade route along the Don River in favor of the Khazars. Accounts vary regarding the events, with discrepancies between contemporary and later sources. The exact outcome is unknown. The Rus'–Byzantine War of 941 took place during the reign of Igor of Kiev. 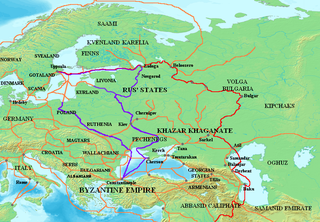 The Khazar Correspondence reveals that the campaign was instigated by the Khazars, who wished revenge on the Byzantines after the persecutions of the Jews undertaken by Emperor Romanus I Lecapenus. The first naval attack was driven off and followed by another, successful offensive in 944. The outcome was the Rus'–Byzantine Treaty of 945. The Christianization of the Rus' people is supposed to have begun in the 860s and was the first stage in the process of Christianization of the East Slavs which continued well into the 11th century. Despite its historical and cultural significance, records detailing the event are hard to come by, and it seems to have been forgotten by the time of Vladimir's Baptism of Kiev in the 980s.